The winning entry of a design competition held for a site within the historic Japan Women’s University campus. 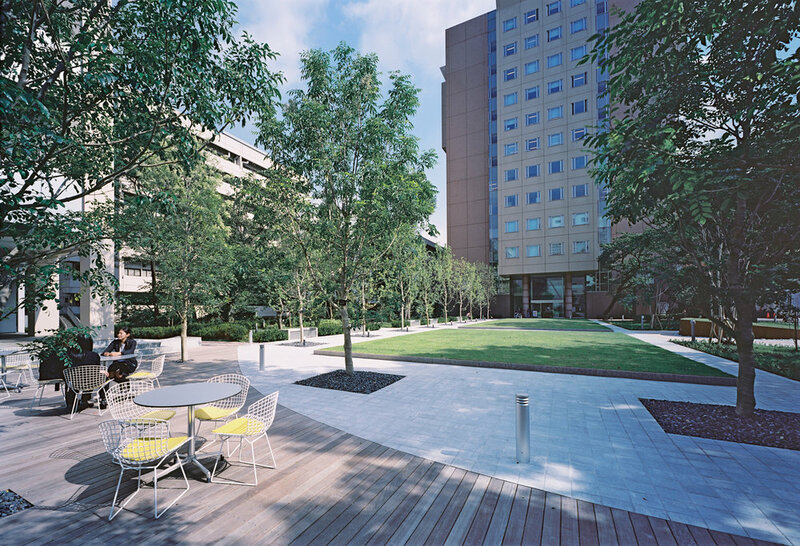 e project is located atop a hill in central Tokyo in the former site of a symbolic academic building of the Mejiro Campus. 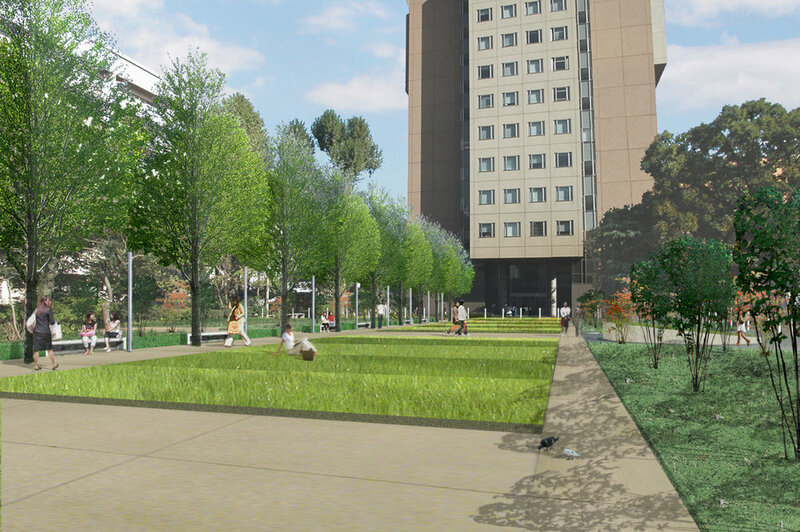 e competition called for a design of a new plaza that would provide a symbol for the university while preserving the numerous trees existing on the site. A loose triangular ring encircling the entire plaza. It gives shape to the whole site while maximizing the area of preserved greenery. e shape represents the three founding principles of the university and also reflects the shape of the campus that forms a triangle bounded between the Mejiro-dori and Shinobazu-dori roads. A large central lawn. e horizontality of the space presents a contrast to the verticality of the large volume of the new academic building tower nearby. e line of deciduous tall trees along the lawn traces the shape of the old building that formerly existed on the site and serves as a foothold for carrying the past into the future. In addition to preserving the existing vegetation, we made subtle changes to the terrain, adjusted the shapes of the trees, and introduced mid-sized trees and ground plantings to transform the greenery into a copse of mixed trees thinned to allow for views through to the other side. is describes the stance that we held in approaching the design and relates to all of the three previous concepts. Even while our plan was the most minimal among the competition proposals, by reading carefully into the existing structure of the site and giving the space a new framework, it presented the possibility to implant clear meanings and unique identities to each of its different areas.